Black Lives Matter co-founder Alicia Garza speaks at the IOP. 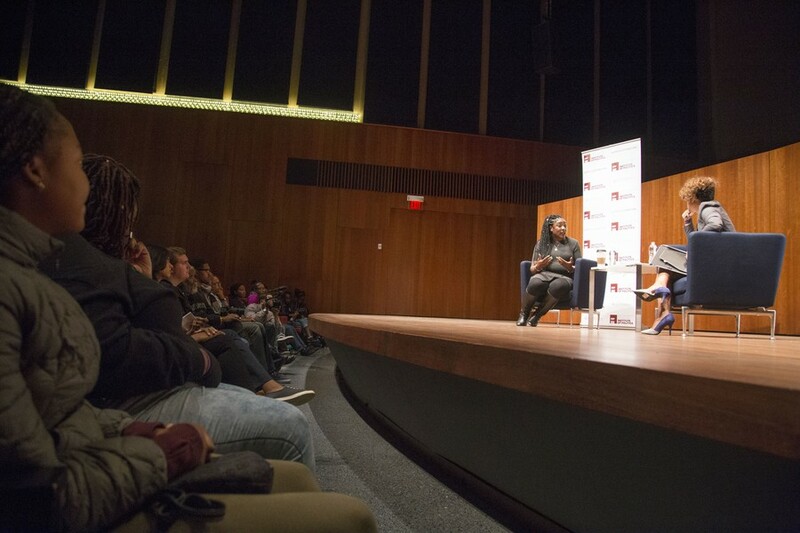 The woman who helped coin the term “Black Lives Matter” (BLM), Alicia Garza, gave a talk Wednesday about that movement, police abolition, and intersectionality in activism. Garza began the conversation by clarifying what BLM is. “It is the very notion that black lives matter in a world where black lives are being targeted systematically for demise for destruction for disregard,” Garza said. She emphasized that BLM is the idea that black people are deserving of dignity, respect, and humanity and have contributed to the building of the nation. Garza responded to a common retort from the movement’s critics. Garza first used the phrase “Black Lives Matter” in a Facebook post responding to the acquittal of George Zimmerman, who shot and killed Trayvon Martin. The phrase is commonly used to refer to protests and activism around police killings and other instances of racial injustice, but it is also the name of an organization Garza co-founded with two other activists. The moderator asked Garza about the application of the phrase to other projects and organizations. “This conflation of everything being black lives matter creates a lot of conflict…. There is a distinction. We do not make [the] distinction to be competitive. We make distinctions to be able to lift up the work people are doing and to give credit where credit is deserved,” Garza said. To Garza, it is important to understand the nuances and different strategies that activists are using to achieve the common goal of black freedom. She encouraged the audience, and the media alike, to research the different organizations and not combine them as one. Next, Garza touched on the question of reformation versus abolition of the police. Often seen as mutually exclusive, she instead believes that reformation and abolition can influence and impact one another in many ways. Rather than an ideological question, she sees reformation and abolition as a strategic one. She discussed the importance of using reformation as a strategy to immediately deal with issues people are facing, but to also work to move beyond it to the end goal of abolition of the police. According to Garza, many people have a difficult time understanding how abolition of the police is possible. She thinks that more work needs to be done to make abolition less theoretical. “What I see this movement doing is making the impossible possible. This question of abolition fits right inside that for me,” she said. Garza then moved on to talk about intersectionality within the BLM movement. She stressed that intersectionality is not about identity politics and at times the lack of political spaces for people can be reflected in movements. People can disregard and alienate the experiences of others even in a common movement for freedom. The IOP plans to have a “larger discussion” examining options for affecting social change this school year.